This time of year I’m all about the festive flavors. I love filling the house with warm spices and hearty foods that make me feel all cozy while wrapped under a big blanket. With Thanksgiving right around the corner, I’ve taken the chance to think about how to incorporate lighter fare into my meals while still using the ingredients that are so prominent during these holidays. Having taken the last year or so to really focus on my health and incorporating wellness into even more aspects of my life, I’ve discovered those staple ingredients that I always have on hand. 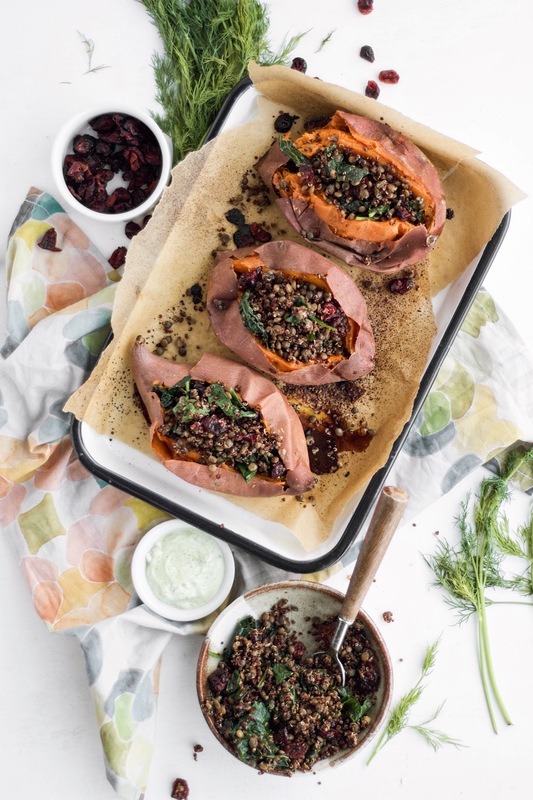 Sweet potatoes are one of those vegetables that is so easy to cook up into a healthy and filling meal, and while I eat them year-round, they taste even better during these months. Roasting them low and slow in the oven really gives them the chance to get nice and sweet while caramelizing the sugars they have. You could easily stuff these guys with any of your favorite toppings :: greens, rice, lentils, etc. I made this lentil and quinoa stuffing that is the perfect savory pairing. I really wanted to celebrate the season, so I added a handful of cranberries to the mix and they end up like these sweet little gems in the mix. Just because this is the season of indulgence, doesn’t mean you can’t have those rich flavors – I like using holidays like this as a chance to play around with these classic flavors and use them in ways that are a little better so that when it does come time to indulge, you can! Give these potatoes a shot and let me know what stuffing combos you love! 2. Rinse the sweet potatoes and place directly onto oven rack. Bake for 45 – 60 minutes until the potatoes are soft and cooked through. Set aside. 3. In a stove top pan, add the ghee and bring up to a medium heat. Add the spices to the ghee and heat for about a minute. 4. Add the lentils and quinoa and toast for about 5 minutes until warmed through. Add the greens and toss with the quinoa and lentils until they are slightly wilted. 5. Remove the pan from the heat and mix in the cranberries. 6. Cut the sweet potatoes down the middle and add the lentil stuffing into the potato. What are you favorite healthy fall recipes?